This is something rare in the convention world, as I’m sure I don’t need to explain to most people reading this. Most conventions are trying to change, but most don’t go quite far enough. Most use the excuse of not wanting to “stifle creativity” or “create an environment where people are afraid to talk to each other”. CONvergence, on the other hand, has designated its entire con as “Safe Space”, the convention hotel is practically papered with “Costuming is not Consent” signs, and all staff and volunteers are designated as people to go to if you have a problem. In the past two years of going to CONvergence I’ve only had two unpleasant interactions with people, and neither of those crossed the line. That’s fewer problems than I generally have in a half an hour at another con. And more importantly, I feel like I can go to any representative of CONvergence if something does happen, and have my problem taken seriously and addressed in an appropriate, sensitive manner. Song of Ice and Fire and SCIENCE! 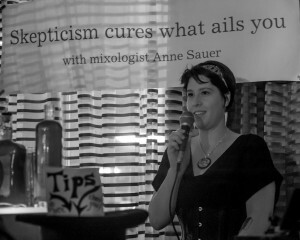 Anne gives her talk about the amazing Skepchick Cure-All at the Skepchick room party – CONvergence 2013. Photo by Jamie Bernstein. Of course, like any con, when we’re not doing panels, there will be all sorts of other things going on. Room parties are a *huge* part of CONvergence’s social scene We hold a nightly party in room 227, the Skepchick Space Lab, which is right next to the Freethought Blogs Sealab in room 228. We’ll be having mixology demos with Mad Art Lab resident mixologist, Anne Sauer, bioluminescence painting with Siouxsie Wiles, some fantastic drinks from our hardworking bartenders and all the fun! A note on room parties: You don’t have to drink to enjoy them. Alcohol is available at most parties for a recommended donation or tip (and please remember to tip your bartenders! Tips are how many of the groups can afford to run a party room. It costs more than you think). But drinking is not a requirement. Most of the rooms have their bar areas on their balconies, and card at the door to the balcony, so under 21s can still hang out in the main room areas. We have several non-drinkers in our group, and you will not be ostracized for not partaking. During the day, Skepchick will be hosting informal Salons in our party room – room 227 – for events we thought would make better small group discussions/activities rather than large panels. Stop by the room to check out the schedule! 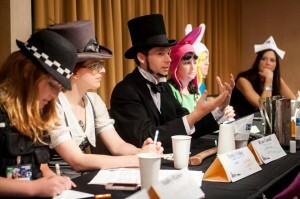 Mad Art Lab demonstrates the advanced technique of Paneling, Costuming and Wearing Hats at the same time. Don’t try this at home, kids. We’re professionals. Photo by Jamie Bernstein. Also: Costuming! 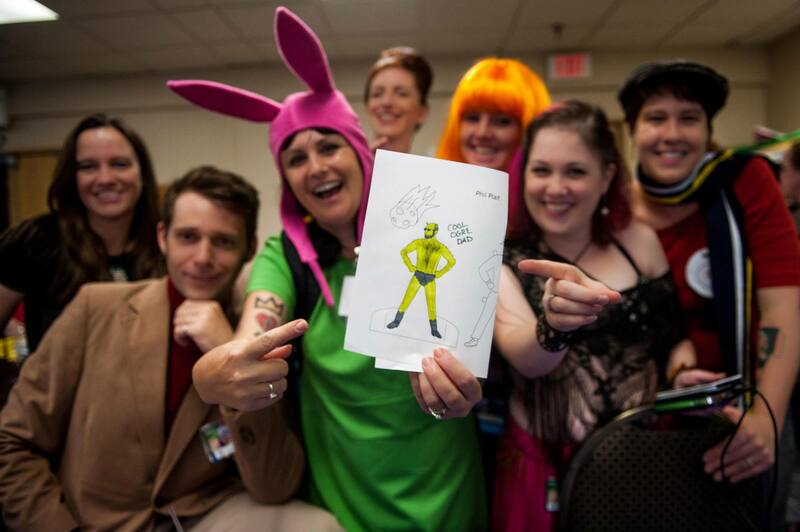 CONvergence is a con that truly takes joy in cosplay. You don’t always see the huge builds and showstopping armors that you would at a place like DragonCon, but I’ve rarely seen such sheer delight in costuming of all levels. Everyone is appreciative of all costumes here, no matter if this is your first one or you’re a master costumer. I’m taking it easy for this year for costumes. By “taking it easy”, I mean I’m going to limit myself to only one or two costumes a day. I’ll be bringing my Hawkeye: Kate Bishop costume (Bro! ), as well as a 90s Jean Grey/Marvel Girl (Because shoulderpads), Agents of SHIELD’s Victoria Hand and anything else I manage to finish up this weekend. (Such is the life of a costumer. If you’re not working up until the moment your plane arrives, you’ve probably forgotten to do something.) I know the rest of the Skepchick Network people have some fantastic group costumes planned as well. This entry was posted in geek culture, scicomm. Bookmark the permalink. Forgive me if this the wrong place to ask the following. I came across your name while looking over the skeptics of Cincinnati group. I would like to get involved with such groups in this area. I’m blind and thus, don’t drive. I live in the Fairfield area, between ForestPark and Springdale. Do you know of anyone in this area. Great Job!! Enjoy this website, so much data that is truly educational and intriguing!! Definitely happy I found it!! She show her says “hey, let’s talk about this issue”, and sits everyone down for an honest discussion about concerns. Over free giant bowls of soup from the Con Suite.